Relish a weekend with Swamiji, doing practices with her, receiving her teachings and doing seva to support her mission. These weekends with Swamiji are now dedicated only for Members of our Vowed Order. This came about because, over the last 10 years, it has been primarily those yogis attending the B&B weekends. Bring your Guru Gita book and meditation journal. 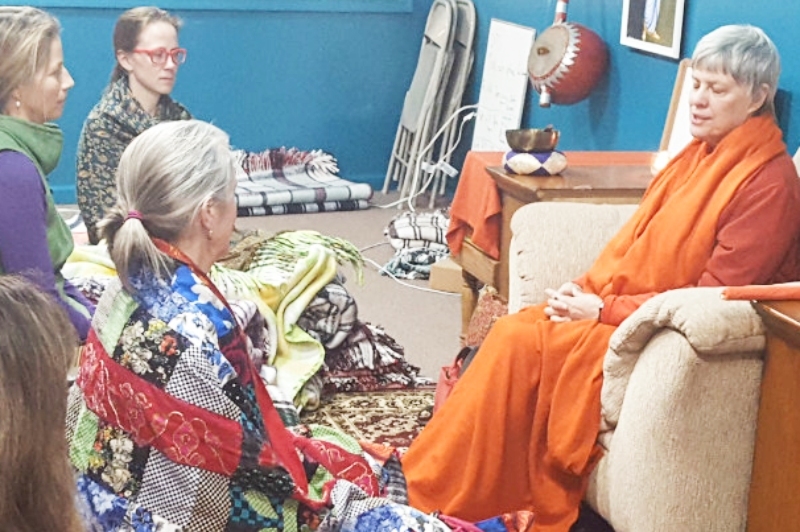 You’ll need comfortable clothes for yoga, plus nice clothes for chanting, meditation and satsang with Swamiji, and seva clothes for cleaning and/or garden work at Lokananda and/or Shivaloka. Enjoy a private meeting with Swamiji, to ask or discuss anything you would like. This is scheduled as part of your weekend, and is one of the reasons that attendance is limited. Enroll early to assure your spot! Time: Dinner at 5:30 pm with program begining at 7:00 - 9:30 pm, middle days 6:30 am - 9:30 pm (less meals & recesses), last day 6:30 am - 12:30 pm (less meals & recesses). Vratins and Brahmacharins are eligible to attend any and all of the B&B weekends. Sadhakas are eligible to attend one per year. Early Cancellation: Full refund if cancelled 2 weeks or earlier prior to the B&B visit. You will receive a full refund of all moneys paid if your refund is given by check, or full refund less 8% cancellation fee if refund is given by credit card (due to the credit card fees involved). Allow up to 2 weeks for processing. Later Cancellation: Between 2 weeks and 2 days prior to the B&B visit: you will receive a 50% refund. Late Cancellation: Within 2 days of the visit start date and up until the visit begins: there are no refunds.